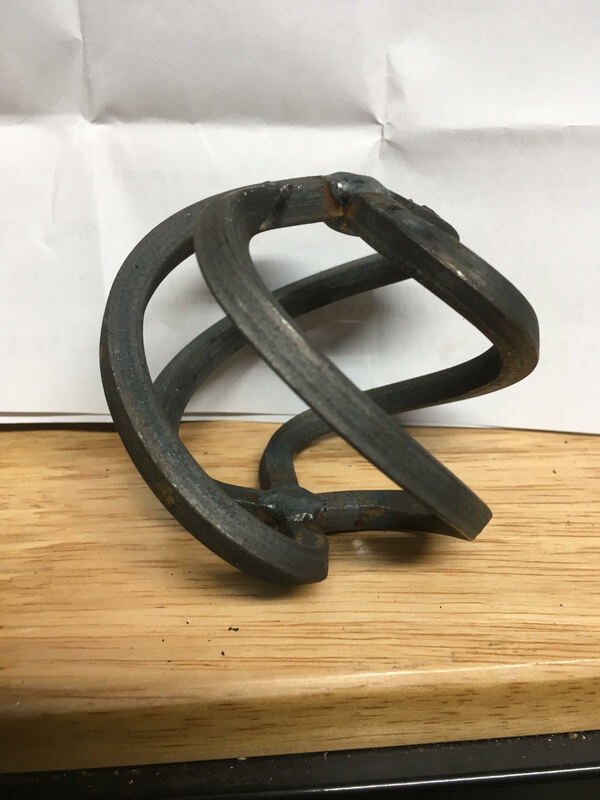 Another project that I'll try sometime is forging an apple. Seems to me that it would sell well in the late spring at craft shows as a end of school year gift for teachers. One article I've seen uses 2" pipe (the OD is really about 2 1/2"). Pat spends a lot of time demonstrating at Silver Dollar City and says that his apple demo is always well received. 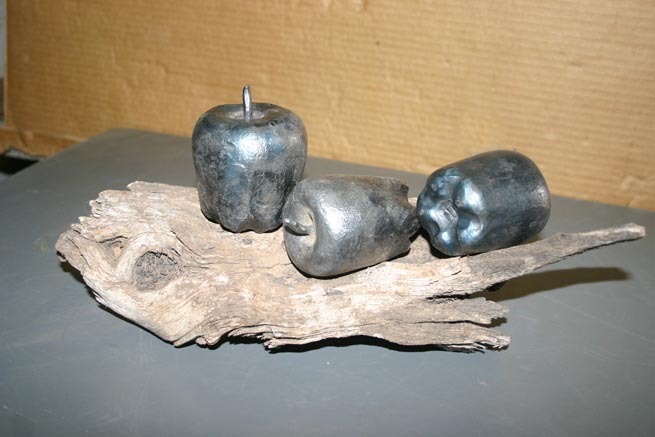 When he starts out with a piece of pipe and tells them he is going to make an apple, most ask what's that, not being able to make the connection to the fruit in the current context. By the time he's done, he gets a lot of ahhhh an apple. Pat starts with a piece of 2" pipe. Make sure you block the end so the heat doesn't come through the pipe and burn your hand. 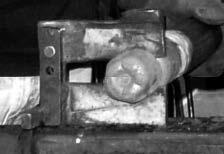 He uses a welded seam pipe and sometimes the seam opens up. If that happens, it's best to pick a new spot and start over, it's almost impossible to fix a cracked pipe and have it look right. You could avoid this problem by using seamless pipe (dom), but that is outrageously expensive. Working real hot helps to lessen the problem. He starts by fullering the pipe about 1 1/2" from the end. He has a special tool to do this which is adjustable and can go all the way from 2" down to 0", a pretty handy device. Once it is fullered all the way down, i.e. the hole is closed up. He cuts the end off with a hack saw. The little nub that is left is marked with a chisel. In nature, this piece has 7 sections so Pat makes 7 cuts with the chisel. 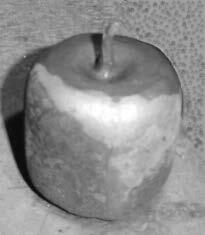 The bottom of the apple needs to be tapered, Pat goes for a delicious apple look which has 5 bumps on the bottom. To get the 5 sided look you can't hit straight down, you have to come at it from an angle. If you turn it frequently, always hitting at an angle you can coax into the pentagon shape. 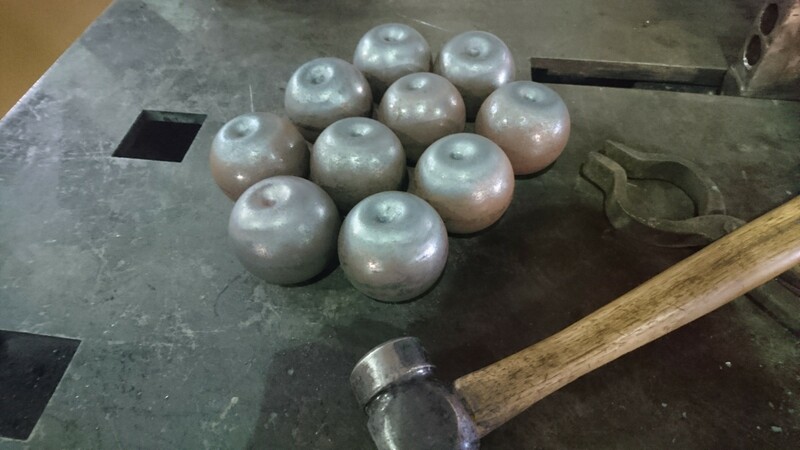 Once you have a nice pentagon-ish shape, hold the pipe in the vice and use a hollow punch to drive the little nub a ways up into the base of the apple. Use a fuller on each of the 5 flats to further define the 5 bumps on the base of the apple. Go about 3" up from the bottom and section the apple off of the main pipe. 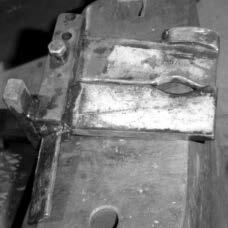 Like with the base, the fullering is taken all the way down to where the hole is closed up. A gain the piece is hack sawed off of the main pipe. This time the cut is made as far up on the main piece as possible. It is important to leave as much material as possible to make a stem out of. 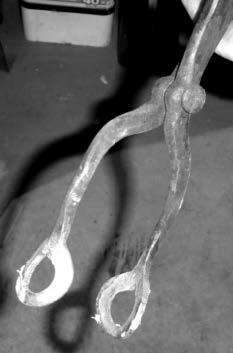 When the apple is cut loose from the pipe, Pat has a special set of tongs that he made just for holding apples. The nub is drawn out as far as possible. It may crack at the end, but this is OK because it will make it look like it was ripped off the tree. 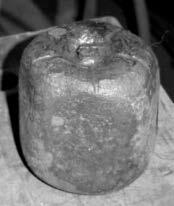 Once the nub is drawn out into a stem, it is driven down into the top of the apple with a hollow punch. The stem is then bent slightly to the side to make it look more natural. Pat garnishes the apple with a leaf that he makes and holds in place by drilling a small hole in next to the apple stem and sticking the leaf stem into it. Another idea I have is to use a "basket" for the apple and then add a stem and a couple of leaves. We'll see how it turns out. A lot depends on whether or not the powder coat paint will satisfactorily coat the inside of the basket to ward off rust development. Wouldn't it be neat if I could powder coat the inside with white or ivory and the outside with red (or green since my favorite apples are Granny Smiths)?